The author of Station Eleven talks about writing, dancing, survival and the book she thinks should survive the apocalypse. 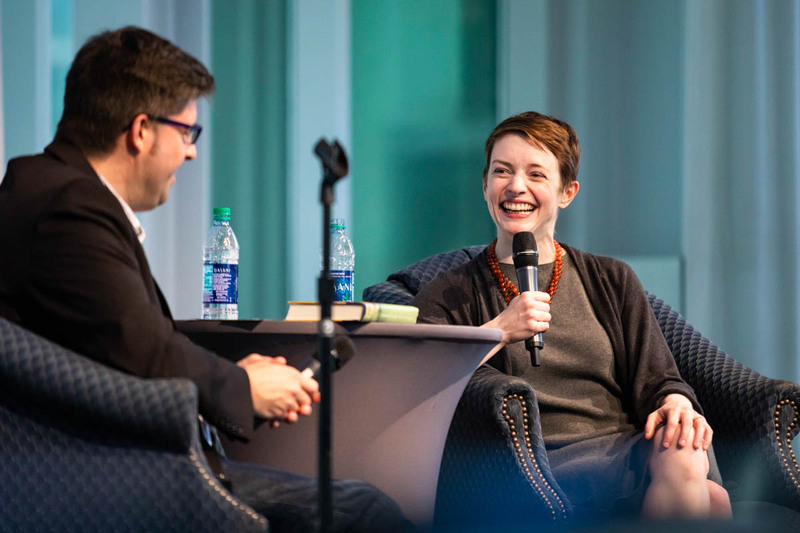 “There’s a part of me that feels like the life of Station Eleven was something like being struck by lightning or winning the lottery,” says author Emily St. John Mandel, reflecting on the success of the novel that served as the focus for this year’s NEA Big Read at UCF. Translated into 31 languages, a finalist for the 2014 National Book Award, and the 2015 recipient of the Arthur C. Clarke award for best science fiction novel, Station Eleven certainly defies conventional literary odds. The novel — simultaneously about a travelling symphony, celebrity culture, Shakespeare, and epidemics — explores the role and survival of art in a post-apocalyptic world. 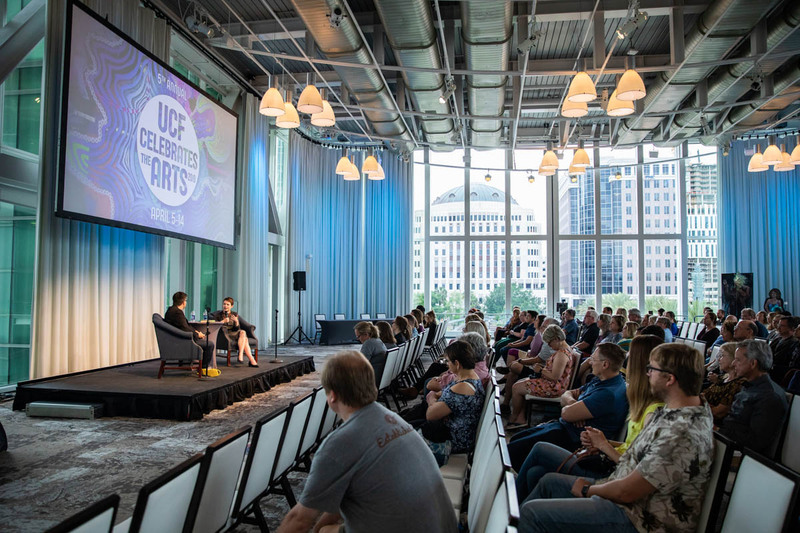 Before her event, which was part of UCF Celebrates the Arts at the Dr. Phillips Center for the Performing Arts, I spoke with St. John Mandel about how this lightning strike of a novel came together, apocalypses, and what books she would save for the end of the world. Adam Byko: You got your start in dance before moving into writing. Did you feel you transitioned skills or a mentality from one artform to the other, or were they two totally different things in your mind? Emily St. John Mandel: I mean, mostly they’re totally different things. But I think dance is really good for developing this kind of fire and self-discipline, which I don’t think is applicable just to the arts. I think if you’re a dancer first, you might go on to become a more disciplined attorney or anything else you do in your life. But it definitely helps with writing. So much of writing is just forcing yourself to sit at your desk and write a novel. So, you know, discipline’s important. In that sense, one’s probably related to the other. AB: Speaking of discipline, I am so curious about your process for writing. Both the books I’ve read of yours have really interesting structures. With Station Eleven there’s a graphic novel, theater, paparazzi, and on top of that a whole post-apocalyptic wasteland. How does this all make the leap from your head to the page? Do you start with one plot and then things spiral, or are you juggling multiple plots right from the get-go? ESJM: I start with one thing usually. With all of my books, it’s just been one thing. Sometimes it’s just kinda a wisp of a premise… For Station Eleven, my original idea was partly just to write something really different from my previous three books. I felt like I was drifting in the direction of crime fiction. And that’s kind of a delicate point because I really like crime fiction — I have such respect for what crime writers do. But you can get trapped in these marketing categories and it’s hard to ever break out as a writer. So I wanted to do something a bit different. And my starting point with Station Eleven… I guess it was that Shakespeare performance [of King Lear] that opens the book. Even before I knew the book was going to be post-apocalyptic, it was always going to start with that actor dying of a heart attack. AB: So in the original conception of the book, there was no mass epidemic? ESJM: Yeah, it was going to be set completely in the present day. I was going to write this — in retrospect — somewhat precious book about the importance of art in our lives. Which it still is, but it was going to be just about the lives of actors in a travelling company. The trials and tribulations of this underfunded Shakespearean troupe. And it wasn’t until I started writing that that I added the post-apocalyptic element. It seems like a bit of a leap, but I wanted to write about our technology, and I thought an interesting way to do that would be to contemplate its absence. AB: A major theme of the book is summed up in the quote “Survival is Insufficient” [from Star Trek], especially in regards to the arts. Your book came out in 2014, and the world has continued to change since then. As someone making art in this world, does that phrase mean more to you now or has it had a continuous influence? ESJM: I would say it’s been continuous. There are definitely things about the world in 2019 that trouble me deeply, that weren’t even on the horizon in 2014. Like consensual reality? That’s something I really miss. [Laughs]. When we all used to have one set of facts from which we drew different conclusions. That was a nice thing that I took for granted in retrospect. So you can make an argument that the world’s become more bleak, but I feel like we always think we’re living at the end of the world. You know, when have we ever felt like it wasn’t going to be catastrophic? So there’s some comfort in that. AB: I want to go back to the structure question and how you braided so many narratives together. I’m so curious about the order. When did each element manifest in the draft as you were editing the novel? ESJM: Right, so I know the first element was Arthur dying on stage. I always knew it was going to be a nonlinear narrative because that’s the only way I know how to write novels if I’m being honest here. I knew I could kill him off on page three and we could still get a lot about his life. I think my next element was actually Miranda. I wasn’t sure for a long time how that character fit into the narrative though I remember all kinds of weird variations. Like at one point she was the executive assistant of Arthur’s sister Claire, who doesn’t exist by draft number three. I just always had a vision of who she was as a character: Graduated art school, practicing her art around the margins of her day job, which, as the graduate of a program in contemporary dance, was something I knew a lot about. So it was Arthur, then it was Miranda, and then I think the next element was the post-apocalyptic stuff, when I started writing about the Travelling Symphony. Clark was the last element, and kinda the last character who came together. With Clark — and this goes back to what happens to your work when you don’t have an outline — he was originally such a minor character. I was originally thinking, “Well Arthur’s throwing a dinner party. He should really have an old friend.” And I found I just really liked him. He was fascinating to me. He was the only character who I had a really vivid picture of. During my time at The Rockefeller University, there was a postdoc who I used to see all over campus. I don’t know his name or what lab he worked in. But he had the most fabulous sense of style. He was probably, I don’t know, early thirties. Probably six foot three, very thin, wore these great vintage suits, which, because he was so tall, ended about four inches above the ankle, with bright pink or striped socks and his hair was shaved off on one side and floppy on the other and sometimes pink? I think it’s fair to say that scientists are not particularly renowned for their sense of style — writers aren’t either [laughs] — but this guy just had an incredible look about him. And for some reason I was picturing him as I was writing the young Clark, and he just took over and became more and more interesting to me. That was the last major element of the story to come together. I was really playing around endlessly with the structure of this book. I remember I was changing the order of entire sections, pretty much right up to the end. AB: Your next novel The Glass Hotel is going to be about a Ponzi scheme? ESJM: Yeah that was the central focus. Although, one of the nice things, and also difficult things about not writing from an outline is that the thing that you think will be the central focus of the book becomes like focus three of three. [Laughs]. So at this point, it’s a ghost story with a Ponzi scheme in it. And also a lot about container shipping, which remains an area of fascination for me. AB: I can see the parallels between those two books [The Glass Hotel and Station Eleven]. ESJM: Yeah, Miranda’s in it. She’s a small character. AB: Oh wow, Miranda’s back? ESJM: And her boss, Leon, also makes an appearance. AB: It’s very good to hear that, at least in one timeline, Miranda’s doing well. ESJM: Yeah, there’s a universe where she’s successful in shipping [laughs]. AB: Let’s say we had a Museum of Civilization, and you could put five books in there. What five books would you want to save for those post-apocalyptic future generations? ESJM: That’s a great question, I don’t think I’ve ever had it framed in quite those terms. I think the first one I would pick would be Suite Francaise by Irene Nemirovsky. It’s an incredible novel, and the story behind it is equally amazing. Nemirovsky was from Russia originally and emigrated to France as a teenager in the 20s. By the time the Second World War broke out she had converted to Catholicism from Judaism, but that didn’t save her. She was arrested and sent to Auschwitz because she was Jewish. She died there. She left behind two young daughters who survived the war. And she also left behind a notebook filled with minuscule handwriting. The daughters assumed that that was her diary, and it was too painful to even contemplate reading it. They never opened this thing until decades had gone by and they were well into adulthood. They had this moment where they have to come to terms with this and read their mom’s diary. They got out a magnifying glass and started transcribing. It wasn’t a diary. It was a magnificent novel about the Nazi invasion of Paris. So I think there’s a lot in there. I choose it both because it’s beautiful, but also I suppose it touches on that larger theme of how you maintain or fail to maintain your humanity in a moment where Nazis are invading Paris so to speak, in a moment where things are precarious and everything’s falling apart. So that’s the first book I’d choose…. I don’t know about the other four [laughs]. I’ll have to think about that. Adam Byko is a student in the MFA in creative writing program.